A woman is seated at a desk. A curly-haired man walks past. 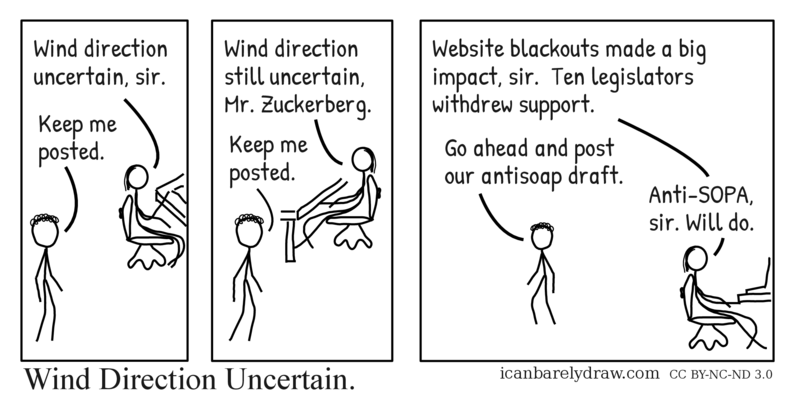 Woman: Wind direction uncertain, sir. The woman is seated at a desk again, and the curly-haired man walks past again. Woman: Wind direction still uncertain, Mr. Zuckerberg. Woman: Website blackouts made a big impact, sir. Fifteen legislators withdrew support. Man: Go ahead and post our antisoap draft. Woman: Anti-SOPA, sir. Will do.